�����Florence Minchan Tynan was born circa 1880 at , Dodge County, Wisconsin. She married David Wilbur Boylan, son of Howard Boylan and Delight How, on 27 April 1900 at Carroll County, Iowa. As of 27 April 1900,her married name was Boylan (Minchan Tynan). [S70] Unknown record type, unknown repository address, Wisconsin, Dodge County, Town of Beaver Dam, p. 36, Line 40, Dwelling 256, Family # 254; Roll 1710, Book 1, Page 85, MyFamily.com, Inc., 21 May 2003. [S92] Unknown record type, unknown repository address, Iowa, Cherokee County, Diamond, FHL Film 1254332, NA Film T9-0332, Page 82C; FamilySearch.com; 20 May 2003. [S14] Twelfth Census of the United States, South Dakota, Buffalo County, Crow Creek Indian Reservation; Roll T623 1547, SD # 2, ED 376, Sheet 22A, Line 19, Ancestry.com 14 Jan 2007. [S98] Unknown record type, unknown repository address, South Dakota, Buffalo County, Township 106, Crow Creek Indian Reservation, Crow Creek Agency; Roll T624_1477, SD # 1, ED # 80, Image 688, page 10B; Line 2; Ancestry.com image 14 Jan 2007. [S97] Unknown record type, unknown repository address, South Dakota, Buffalo County, Crow Creek Reservation, SD# 312, ED# 33, Sheet No. 6A, Line No. 16, Government Quarters, Dwelling No. 112, Family No. 112; Ancestry.com image 19 Mar 2003. [S137] Unknown record type, unknown repository address, Wisconsin, Milwaukee County, Milwaukee City, 5th Ward, Block 521, ED# 40-62, SD# 11, Sheet 18B, Line No. 71, Dwelling No. 13, Family No. 21; Ancestry.com image 19 Mar 2003. �����Daisy Rose Salinger was born on 20 December 1881 at Iowa. She was the daughter of Benjamin Isaac Salinger and Lucy Malissa Boylan. Her married name was Minchen (Salinger). [S75] Unknown author, "E-mail," e-mail to unknown recipient, from Tom Root [e-mail address]; 23 Apr 2009. [S9] Unknown record type, unknown repository address, Wisconsin, Dodge County, Town of Beaver Dam; Page 100, Line 36, Family 192, Dwelling 192; Ancestry.com image 26 Jan 2004. [S14] Twelfth Census of the United States, Wisconsin, Clark County, Lynn Town, SD # 8, ED # 26, Sheet No. 7A, Image 146; Line 11, Dwelling 103, Family 105; Genealogy.com image 07 Sep 2004. [S70] Unknown record type, unknown repository address, Wisconsin, Rock County, Town of Newark; Page 4; Line 7; Dwelling 24; Family 24; Ancestry.com image 26 Jan 2004. [S53] International Genealogical Index (IGI), Batch No. : M514842 1871 - 1885 Source Call No. : 0914148V.C-E Film; http://www.familysearch.org/Eng/Search/igi/…... 26 Jan 2004. [S92] Unknown record type, unknown repository address, Missouri, Crawford County, Courtois Township; SD#3, ED# 54, Page 29 [Image 49A]; Line 3; Dwelling 248; Family 251; Ancestry.com image 26 Jan 2004. [S163] Unknown subject unknown repository, Ileen (ROOT) GREER dated 25 Aug 1972 received from her nephew, Tom Root, on 10 May 2009. [S98] Unknown record type, unknown repository address, Illinois, Winnebago County, Roscoe Township, SD# 3, ED# 177, Sheet No. 1A, Line 17, Dwelling 6, Family 6; Ancestry.com image 26 Jan 2004. [S97] Unknown record type, unknown repository address, Illinois, Winnebago County, Rockton Township, Rockton Village, SD# 4, ED #220, Sheet No. 18A, Line No. 45, Dwelling 180, Family 190; Ancestry.com image 26 Jan 2004. [S137] Unknown record type, unknown repository address, Illinois, Winnebago County, Rockton Township, Rockton Village; ED # 101-64; SD # 2; Sheet No. 7A; Line 24; Dwelling 161; Family 175; Ancestry.com image 08 Feb 2005. [S75] Unknown author, "E-mail," e-mail to unknown recipient, from Tom Root [e-mail address]; 26 Apr 2009. [S14] Twelfth Census of the United States, Wisconsin, Clark County, Lynn Town, SD # 8, ED # 26, Sheet No. 7A, Image 146; Line 13, Dwelling 103, Family 105; Genealogy.com image 07 Sep 2004. [S177] Ken Fiebelman Ozark Friends & Neighbors, p 369, col. 1. [S70] Unknown record type, unknown repository address, Missouri, Crawford County, Courtois Township; Page 03, Line 33; Roll: M593 772; Page 609, Image 592. [S92] Unknown record type, unknown repository address, Missouri, Crawford County, Courtois Township; SD#3, ED# 54, Page 29 [Image 49A]; Line 2; Dwelling 249; Family 252; Ancestry.com image 26 Jan 2004. [S70] Unknown record type, unknown repository address, Missouri, Crawford County, Courtois Township; Page 03, Line 33; Roll: M593 772; Page 609, Image 592; Ancestry.com image researched 23 May 2009. [S14] Twelfth Census of the United States, Wisconsin, Clark County, Lynn Town, SD # 8, ED # 26, Sheet No. 7A, Image 146; Line 12, Dwelling 103, Family 105; Genealogy.com image 07 Sep 2004. [S98] Unknown record type, unknown repository address, Illinois, Winnebago County, Roscoe Township, SD# 3, ED# 177, Sheet No. 1A, Line 18, Dwelling 6, Family 6; Ancestry.com image 26 Jan 2004. [S97] Unknown record type, unknown repository address, Illinois, Winnebago County, Rockton Township, Rockton Village, SD# 4, ED #220, Sheet No. 18A, Line No. 46, Dwelling 180, Family 190; Ancestry.com image 26 Jan 2004. [S137] Unknown record type, unknown repository address, Illinois, Winnebago County, Rockton Township, Rockton Village; ED # 101-64; SD # 2; Sheet No. 7A; Line 25; Dwelling 161; Family 175; Ancestry.com image 08 Feb 2005. [S120] Electronic Web Site, Pioneer Wheelock Family; http://www.rootsweb.com/~nyjeffer/wheelocp.htm; Page 1 of 5; 24 Aug 2003. [S120] Electronic Web Site, http://awt.ancestry.com/cgi-bin/igm.cgi; 23 Jul 2004. 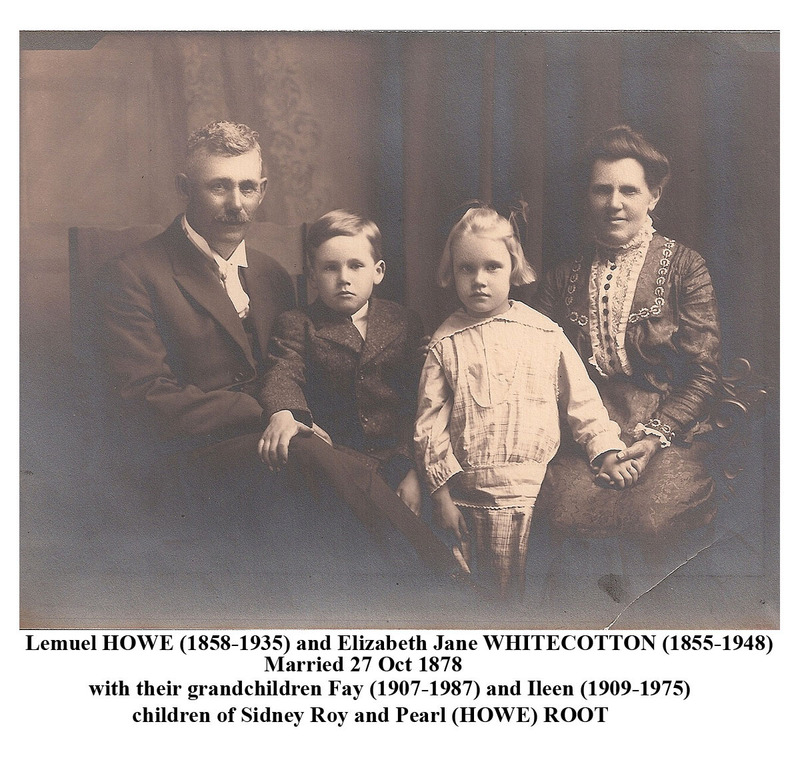 [S75] Unknown author, "E-mail," e-mail to unknown recipient, Genealogical Notes on the HOW(e) Family from Vera SAKEMILLER ROOT from Tom ROOT; May 2009. [S120] Unknown author, "Electronic Web Site," e-mail to unknown recipient, GenForum; Tree of Edward Howe, p 6 of 10; http://genforum.genealogy.com/cgi-bin/print.cgi/…; 30 Jan 2004. [S120] Unknown author, "Electronic Web Site," e-mail to unknown recipient, GenForum; Tree of Edward Howe-Isaac HOWE, p 3 of 9; http://genforum.genealogy.com/howe/messages/2959.html; 30 Jan 2004. [S157] Franklyn Curtiss-Wedge, Rice and Steele Cos. MN Vol. II, p. 1129. [S120] Unknown compiler, Electronic Web Site, http://awt.ancestry.com/cgi-bin/igm.cgi; 23 Jul 2004. [S120] Unknown compiler, Electronic Web Site, GenForum; Tree of Edward Howe-Isaac HOWE, p 3 of 9; http://genforum.genealogy.com/howe/messages/2959.html; 30 Jan 2004. [S79] Paul Volppe, "Electronic Web Site," e-mail to Mildred Andorfer, January, 2000, dated 09 Jun 2002 to Cora Monteen (Monteen6) sent by Joy Arnold (crazyrsus). [S137] Unknown record type, unknown repository address, Wisconsin, Milwaukee County, Milwaukee City, Ward 5, Block 471, ED# 40-57 SD# 11, Sheet No 15B, Line 56, Dwelling 8, Family 11; Ancestry.com image 19 Mar 2003. [S137] Unknown record type, unknown repository address, Wisconsin, Milwaukee County, Milwaukee City, Ward 5, Block 471, ED# 40-57 SD# 11, Sheet No 15B, Line 55, Dwelling 8, Family 11; Ancestry.com image 19 Mar 2003. [S98] Unknown record type, unknown repository address, Wisconsin, Shawano County, Township 28 R 14 East, Stockbridge Indian Reservation, SD# 9, ED# 164, Sheet No. 11A, Image 111, Line 20, Dwelling 89, Family No. 91; Ancestry.com image 19 Mar 2003. [S120] Unknown record type, unknown repository address, Genealogy.com; http://genforum.genealogy.com/howe/messages/3052.html; Re: Descendants of Epenetus b: 1717 james madison; researched 01 Mar 2007. [S139] State Historical Society, Madison, WI, Wisconsin Pre-1907 Vital Records: Births Dane County; Reel 171 Record No.1016 Birth Record ID 2369884; http://www.wisconsinhistory.org/vitalrecords/indes.asp... 15 Jan 2007. [S182] Unknown first party v. Unknown second party, unknown record info: Obituary: Beaver Dam Argus 03 Jun 1897, unknown repository. [S139] State Historical Society, Madison, WI, Wisconsin Pre-1907 Vital Records: Deaths Milwaukee County; Reel 078 Vol 20 Page 0304 Image 1868 Index Vol 07 Sequence # 006995 Death Record ID 15829; http://www.wisconsinhistory.org/vitalrecords/indes.asp... 15 Jan 2007. �����George Marvin Smith Jr. was born on 10 December 1927 at Milwaukee, Milwaukee County, Wisconsin. He was the son of George Melancthon Smith and Marie Florence Van Den Berg. George Marvin Smith Jr. appeared on the census of 10 April 1930 at 573 Hanover Street, Milwaukee, Milwaukee County, Wisconsin; SMITH,George: Son, Male, White, Age 2, Single; School=No; Born in Wisconsin, Both parents born in Wisconsin; Occupation - None.1 He was baptized on 8 December 1950 at Riverside, California. He was Accountant (Ameritech). He died on 27 September 1996 at Columbia Hospital, Milwaukee, Milwaukee County, Wisconsin, at age 68. He was buried on 3 October 1996 at St.James Cemetery. Child of George Marvin Smith Jr.
[S137] Unknown record type, unknown repository address, Wisconsin, Milwaukee County, Milwaukee 12th Ward Block 1121; ED #40-143, SD #11, Sheet 7B; Line 57, Dwelling 18, Family 18; Ancestry.com image 08 Jan 2006. �����Burt Irvin Smith was born on 4 March 1923 at Milwaukee, Milwaukee County, Wisconsin. He was the son of George Melancthon Smith and Marie Florence Van Den Berg. Burt Irvin Smith appeared on the census of 10 April 1930 at 573 Hanover Street, Milwaukee, Milwaukee County, Wisconsin; SMITH, Bert: Son, Male, White, Age 7, Single; School=Yes; Born in Wisconsin, Both parents born in Wisconsin; Occupation - None.1 He died on 18 July 1994 at Milwaukee, Milwaukee County, Wisconsin, at age 71. He was buried on 21 July 1994 at Highland Memorial Park, Milwaukee County, Wisconsin. [S137] Unknown record type, unknown repository address, Wisconsin, Milwaukee County, Milwaukee 12th Ward Block 1121; ED #40-143, SD #11, Sheet 7B; Line 56, Dwelling 18, Family 18; Ancestry.com image 08 Jan 2006. [S163] Unknown subject unknown repository, Family Record of John Philip Marthaler, Peter Friedrichs, 13 March 1871; John and Millie Andorfer, Delafield, WI 53018. [S71] Unknown author, "Family Group Sheet", Franz Pfadt; J. Kimberger Str. 7, 76774 Leimersheim, Germany; e-mail address; 26 May 2004. [S111] Unknown subject unknown repository, Individual Record; submitted by Sharon Weindorf HAWKINS, 382 E 5900 South Murray, Utah 84107; Compact Disc #55 Pin #870630; accessed Familysearch.com 29 June 2007. [S113] Unknown record type, unknown repository address, New Jersey, Essex County, Elisabeth Township; Line 24; Ancestry.com image accessed 19 June 2007 (living in the household of his oldest brother, John MARTHALER). [S120] Unknown record type, unknown repository address, GenForum; Tree of Edward Howe, p 5 of 10; http://genforum.genealogy.com/cgi-bin/print.cgi/…; 30 Jan 2004. [S75] Unknown author, "E-mail," e-mail to unknown recipient, received from Frances HOWE ANDERSON Feb. 2007. [S61] Daniel Wait Howe, Howe Genealogies, p.433. [S120] Unknown author, Electronic Web Site, GenForum; Tree of Edward Howe, p 5 of 10; http://genforum.genealogy.com/cgi-bin/print.cgi/…; 30 Jan 2004. [S75] Unknown author, "E-mail," e-mail to unknown recipient, received from Frances HOWE ANDERSON Feb. 2007. This was a copy of Ballston records recorded by Lewis Howe SEARS. �����Her married name was Lesota. Kathleen Mary Japp was born on 12 October 1948 at Milwaukee, Milwaukee County, Wisconsin. She died on 24 June 1990 at Franklin, Milwaukee County, Wisconsin, at age 41. [S4] Unknown volume, Baptism Record: St. Peter's Catholic Church, Beaver Dam, WI; 1894 p. 2; 30 Apr 2003, unknown repository. [S2] Death - Obituary, Beaver Dam Argus; 28 Nov 1946, p. 1 researched at Public Libary, Beaver Dam, Wisconsin 6 Sep 2008. �����Frances Daniel was born on 13 August 1893. She was the daughter of Peter Daniel and Dorothea Marthaler (Dora)(Eudora). As of circa 1916,her married name was Hesslink. Frances Daniel died on 21 October 1918 at age 25. She was buried at St. Peter Cemetery, Beaver Dam, Dodge County, Wisconsin. �����Verona Daniel was the daughter of Peter Daniel and Dorothea Marthaler (Dora)(Eudora). Verona Daniel was buried at Beaver Dam, Dodge County, Wisconsin. [S14] Twelfth Census of the United States, Wisconsin, Dodge County, City of Beaver Dam, SD# 1, ED# 81, Sheet 1B, Line 61, Dwelling 12, Family 12; Ancestry.com image 13 Feb 2004. [S152] Unknown record type, unknown location, unknown record info, Taylor County, Westboro; Roll: CSUSAWI 1905_29; Image 253; Line 1; Family 39; Ancestry.com image researched 29 July 2009. [S98] Unknown record type, unknown repository address, Wisconsin; Ashland County; Mellen Ward 1; Roll: T624_1700; Page: 4A; ED # 17; Image: 1030; Line 17; Dwelling 52; Family 55; Ancestry.com image researched 30 July 2009. [S97] Unknown record type, unknown repository address, Wisconsin, Dodge County, Beaver Dam; Roll: T625_1982; Page: 3A; ED # 29; Image: 673; Line 32; Dwelling 57; Family 61; Ancestry.com image researched 29 July 2009. [S137] Unknown record type, unknown repository address, Wisconsin, Dodge County, Beaver Dam; Roll: 2568; Page 15B; ED # 9; Image: 754.0; Line 61; Ancestry.com image 29 July 2009.